Research firm IDC is out with its latest estimates on who the leaders of the cloud systems management market are and some familiar names top the list: VMware, IBM and Microsoft. IDC defines cloud systems management as software tooling with the following functionality: Workload scheduling and automation; change, performance and event management; and troubleshooting. IDC expects that by the end of 2017 80% of enterprises will commit to using hybrid cloud computing that uses multiple public cloud providers along with private cloud or non-cloud resources, IDC’s report states. 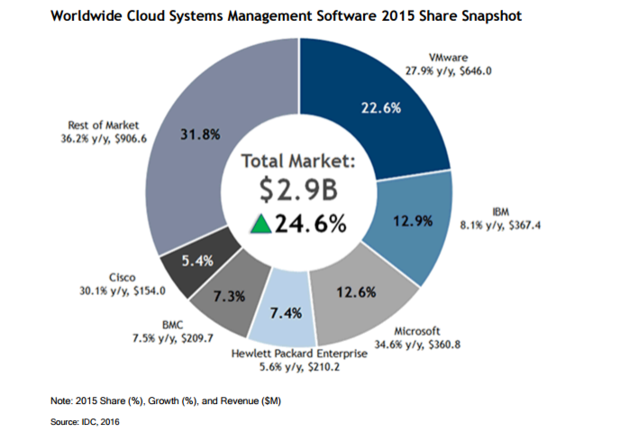 “Customers are using this transition to reevaluate and streamline their in-house management software,” the Worldwide cloud systems management software market share report notes. Overall, IDC says the cloud systems management software was a $2.9 billion market in 2015, up almost 25% from the year prior. VMware held the top market share with 22.6% of the market. IBM had the next highest at 12.9% and Microsoft was right behind IBM at 12.6%. Microsoft had the fastest growing market share for cloud systems management, up 34% compared to VMware growing at 27.9% and IBM only growing at 8.1%. Hewlett Packard Enterprise, BMC and Cisco rounded out the list of the other named vendors in IDC’s report. Almost one-third of the market is made up of all the other vendors selling cloud systems management software.